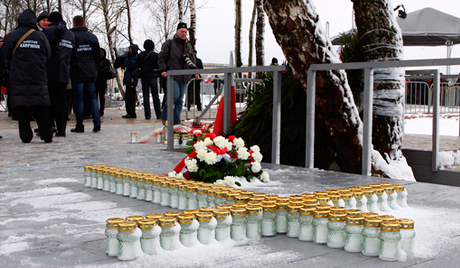 On April 10th 2010, during an attempt to land in thick fog at Smolensk North Airport, a former military airbase, the Polish President’s Air Force Tupolev Tu-154M Aircraft crashed near the city of Smolensk, Russia, killing all 96 people on board. The pilots attempted to land under conditions where visibility was reduced to about 500 meters (or 1,600 feet) and approached too low clipping trees which caused the aircraft to flip upside down, impact the ground, break apart, and eventually come to rest 200 meters (660 feet) short of the runway in a wooded area. All 96 people on board died including Polish president Lech Kaczyński and the First Lady Maria, the Head of the Intelligence Service, Former President Ryszard Kaczorowski, the Chief of the Polish General Staff and other senior Polish military officers, the President of the National Bank of Poland, Poland's Deputy Foreign Minister, Polish government officials, 15 members of the Polish parliament, senior members of the Polish clergy, and relatives of victims of the Katyn massacre. All of the victims were en-route from Warsaw to attend an event in Russia marking the 70th anniversary of the Katyn Massacre at a location approximately 19 kilometers (12 miles) west of Smolensk. For Russia the disaster came at a time when the Russian Federation and the Russian people were taking unprecedented steps and showing unprecedented openness towards the Polish people and the Polish State in attempting to bring closure to one of the darkest moments in Russian-Polish history. Unfortunately the intense pressure and the importance of the ceremony at Katyn coupled with the hurried preparations and errors in the cockpit led to a tragedy of historic proportions and another dark moment in Russian-Polish History. The death of the so many top officials at one time has no parallel in modern history. Never has such an event taken place causing many to fault the Polish side for allowing the entire top echelon of the Polish Government to be on a single airplane at the same time. From the beginning many in the Western media and all over the internet pounced on Russia and tried to find fault with the Russian side with conspiracy theories popping up left and right, every breaking detail being twisted to fit into some black scheme or another. The whole premise that Russian had something to gain from orchestrating such a tragic event in my opinion seemed ridiculous, the entire country was in shock and everyone from the president on down were doing all they could to console and assist the Polish people in their time of shock and mourning but even in such a time of pain and national mourning cynical anti-Russian hysteria reared its ugly mindless little head. I have spoken to many experts and conducted hours and hours of my own research into the tragedy, part of which included studying and reading dozens of theories on the disaster and my conclusion was the same as that of many top professionals. Blame lies with the cockpit crew and with the events that occurred in the cockpit, including the interference and the influence of passengers on the crew. In the end, however, after all is said and done, no matter what else was happening, with the Captain of the aircraft. As for the conspiracy theories, well, there are some that for me could have been developed but for some reason never were and the very fact that they were not can lead one to cast a suspicious eye in that direction. You know as well as I do that when there is a crime committed, the first place to look is at who benefits, who has a motive. This is a tried and true investigative approach and must be part of any healthy debate or thinking in approaching such events. What I noticed, and I am sure that many would not go there, is that many in the West had more to benefit from the disaster than anyone in Poland or the Russian Federation. Now, I am not accusing, or pointing the finger, but just as theories were concocted blaming Russia, based on the flimsiest of evidence, much more could be said for conspiracies involving NATO for instance. With the US and NATO’s aggressive interference in the internal affairs of nation after nation since 1999 and especially since September 11, 2001, one has to ask oneself some hard questions. In the case of Poland, in which the US had already installed its own regime, (remember “Solidarnost” and Lech Walesa and the “color revolution” there?) the problem for the Alliance was quite an acute one. They saw that Poland was mending fences in a real and significant way and in a truly heartfelt manner which was not in any way conducive to allowing for NATO Missile Batteries to be placed on Polish soil to neutralize Russian Defenses. If one is to concoct conspiracy theories then one must look at who benefits and if we look at 9-11 and at the Smolensk crash and at a slew of other such events that I do not have the time nor the space to get into here, then we see a pattern that begins to emerge, a pattern that points to a black and evil plan in progress, that the US and NATO have been engaged in for years. However, we won’t go there. Will we? Not today. We are better than that. Aren’t we? Today is a day of mourning, my thoughts and wishes go out to all of those affected by this tragedy and are with those who perished, may they have found peace. According to International Civil Aviation Organization (ICAO) annex 13, on Russia befell the responsibility for investigating the accident as it occurred on Russian territory. Russia and Poland agreed even though the flight was flown by a military aircraft and Smolensk Northern is a joint civil-military airport not certified by ICAO. Russian President Dmitry Medvedev appointed a special state commission to investigate the accident and placed Russian Prime Minister Vladimir Putin in charge. Other parties were also involved in the investigation including the Interstate Aviation Committee (IAC), accredited investigators from Poland, the USA's National Transportation Safety Board, and the USA's Federal Aviation Administration. The final accident report was published on the 12th of January 2011and placed the majority of the blame for the accident on the pilots. 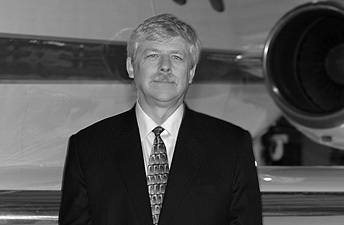 Interview with Capitan John Cox, Chief Executive Officer of Safety Operating Systems in Washington D.C. and a world renowned aviation expert. My first question was regarding the Polish report. Since the crash report is supposed to be complete about the country’s authorities, where the crash takes place, how much weight can we give the Polish report and what were the reasons for them coming up with it? It is unusual for a country to produce a second report outside of the state of occurrence, where the accident occurred. I think that Polish authorities dealt as though some of the Russian report needed some amplification and they elected to produce a second report. It’s not unprecedented but it’s very unusual. Do you see politics playing a role in this process at all? Anytime there is the loss of a government airplane like this – and it has so much visibility – I hesitate to speculate on politics. The Russian report was very well-written. I found it in my experience the Russian investigators have always been very good. They are very thorough. The reasoning behind the Polish report could have some political overtones but I’d hesitate to speculate on it. I’ve recently read an article about the late President Kachinsky – I don’t know if you can speculate on it either – that he often ordered his pilots to land in very dangerous conditions. Have you heard anything about that? There was concern in all the reports that the pilots felt pressure to continue approach. There is a comment on the voice recorder makes reference to if they miss the approach they are concerned that one or more of the passengers will be upset. I think the pilots felt some pressure. To what degree that played in the accident it’s a bit harder to tell. But clearly there was pressure. The Polish report stated the pilots were not prepared. What can you say on this after reading the report? I found that an interesting comment. The pilots were clearly prepared. They’d flown the airplane before, they were properly trained, they knew the type of approach that they would be executing in the bad weather, they had talked to the facility, to another Polish airplane, a JAK, that had landed previously. They knew the weather. So, I would have counted them as being prepared for the approach. To say otherwise, I don’t understand the reasoning behind it. They came in rather low. Were there any reasons for that since it was not an instrument approach? The last segments of the approach are really the core issues for the investigators in the cause to the accident. When the weather is very bad pilots can never get their instruments to a specific altitude. And you know what that altitude is in advance. This airplane descended below that altitude when they still didn’t have adequate visibility to safely land. That’s the core issue, and it’s acknowledged by the Russian report ad also the Polish report. Thad’s the core issue. In the Polish report, did they go to why pilots ignored the TAW system? Can you remind our listeners what that is? The Terrain Awareness and Warning System (TAWS) is a very good bit of technology that helps pilots not have the airplane strike the ground unintentionally, which has been a problem in aviation for decades. This very good technology shows where that potential conflict might be and gives the pilot time to avoid the pending accident. So, in this case, the TAWS did activate and the pilot ignored it. What were the main differences between the Polish report and the Russian report? Did you see any glaring differences? Actually, the two reports are reasonably close. The Russian report centered more on the actions of the crew as being the primary cause and they were very specific about that. The Polish report attempted to spread the cause out, including the Russian air traffic control system, the type of autopilot, the type of aircraft, the training of the pilots. They diversified the cause out much more broadly. Whose fault was the disaster? As an accident investigator, it’s not my job to ascertain fault. The primary causal factor was the descent of the airplane below the proper attitude without adequate visibility to land. Therein is the primary cause. Beyond that there are some contributing causes. Therein is the probable cause of the accident. Are you satisfied with both of the reports? Was that question answered at all as to why they came down so low? I am very satisfied with both reports, particularly the Russian one, which I think was actually very well done. There was some discussion of the pressure the pilots felt as to continue the descent. They knew the weather was bad and the visibility was very restricted. And that is the decision that pilots have to make on a frequent basis. And it’s not always an easy one. But, in this case, they continued, and, unfortunately, they were a bit short of the runway, and the left wing struck a very large tree, causing significant damage and loss of control of the airplane. What questions did you see brought up from the Polish report? Are there any unanswered questions that need to be answered or that we can bring closer to this tragedy? I think we have reached the point where closure to this tragedy is the next step. There have been some training changes. The Polish government has reassigned VIP government travel, reconstituting that specific squadron of the air force. That’s probably a positive step. And I think in the future the Russian air traffic control system will also learn something from this tragedy to be extra vigilant and to assist pilots to the maximum degree they can in terms of bad weather. Out of all the accidents comes the learning process and we try very hard to make the aviation safer. This very high-profile accident will do that also. What lessons could be learnt from this? Interview with Michal Olszacki, a Polish Political Analyst with the University of Reading. You did your dissertation in politics after the Smolensk air crash which killed the Polish president and more than 95 of the top government officials at the time. What was going on in Poland right after that? And why did they decide to politicize this disaster? First of all, I think that many people were surprised with the positive and very helpful actions taken by the Russians. It was commented on very very positively in the Polish news. However, I can see that the problem started after release of the Russian report on the plane crash, and I think it triggered some kind of questions, and, of course, the conflict between the ruling party and the opposition. Just to remind everyone that before he was elected, the president was the founder of the opposition party which is Law and Justice Party, and, of course, his twin brother who is now the main person in the party, officially claimed that this report was a lie, and that triggered some kind of internal conflict within Poland and also raised various questions, difficult questions, towards Russia. So, in response to this report, the Polish government decided to run its own investigation the results of which were published yesterday. You are familiar, of course, with what happened in Katyn? This is one of the biggest obstacles on the way towards good relations between Poland and Russia. Right, just one point to add, I mean it was almost unprecedented because President Medvedev opened up the archives and, it was, I think, a pivotal point in the Russian-Polish relations; it was that important in Poland as well. I think the opening of the archives for the Polish was a big step forward towards good new relations. Vladimir Putin admitted that all those actions consituted terrible crimes, which I believe was also quite an important thing. But nevertheless, the Polish political stage had been already divided, that was why there were two delegations to this anniversary. So, as far as I remember, the Polish Prime Minister Donald Tusk met with Vladimir Putin at the end of the week and I think a couple of days later, there was the second delegation headed by the Polish president. It already shows the current situation in Poland. What is the view in Poland among ordinary people in the street? When they talk about this disaster, do they say it was the pilot’s fault? What do people say? Whose fault was it? I think first of all a lot of people are a bit tired of all this conflict around this plane crash. First of all, I believe that it was a mistake of the pilots, but actually the same idea was shared by the Russian report of the plane crash. I think that people on the street, their opinions are divided depending on the political party they support. So, people who favor the Law and Justice Party perhaps are not happy with the results of both reports and still want the truth ‑ that is the word which come up quite often – the truth, but who knows exactly what the truth was? And the supporters of the Civic Platform mostly agree or partially disagree with the results of the plane crash investigation. I have talked to many experts, and they say the pilot is the one flying the plane. That is his main responsibility. It is the pilot’s fault. Yes. Just to be sure, I think that this whole issue is very broad and it is quite difficult to narrow it down to one thing. Robles: Hello, I’m John Robles with the Voice of Russia, I’m speaking with Douglas Moss, he is the President of AeroPacific Consulting in Torrance, California. We are speaking about the recently released IAC report on the Smolensk air disaster, which occurred in April of last year. For Russia as well as for Poland it was a very, very terrible tragedy. Recently, many politicians in Poland have been trying to politicize the release of this report. Hopefully, this interview will shed some light as to the facts and the actual events that led up to the disaster. Hello Mr. Moss..
Robles: The first question I want to ask you was regarding the people that were in the cockpit during the approach, can you give us some views on that?? Moss: Well, there appeared to be a violation of protocol in aviation. During the approach Tupolev-154 has a three member crew and there were two other people in the cockpit apparently, one seemed to be the Commander in Chief of the Polish Air Force and the other one was the Director of Protocol for the Polish president. In aviation, any time you are below 10.000 feet, primarily in time you are flying an approach, especially in the weather, it’s very important for all the pilots and crew to be focusing on doing just that, flying the approach precisely and doing all the procedures required for the approach and that’s not the time to have other people in the cockpit, distracting the crew, making demands of the crew and trying to influence their judgment. For example, the pilot was trying to determine and assess the weather conditions at the field and whether he had the right equipment and ability to fly the approach. Two other people in the cockpit were encouraging him if not demanding that he continued the approach and make the attempted landing. Robles: So you say they were actually interfering with the operation of the crew?? Moss: Yes, absolutely, that was my impression from listening to the cockpit voice recorder. Robles: And those people they shouldn’t have even been there at the first place. The fact that it was the Commander of the Polish Air Forces. What kind of effect do you think it had on the pilot or the crew?? Moss: It has a tremendous implication. That individual on the flight deck was trying to assert his authority and trying to change the pilot’s judgment and affect his decision-making ability. And even though be or not of indirect pressure there was inferential pressure that would affect his judgment. Robles: You watched the video, I believe, you did watch the video, right?? Robles: They ignored the onboard alert system, I think about six times. Can you comment on that?? Moss: Yes, the airplane was equipped with what sounds like Western terrain collision and avoidance system. It does two things - one, it gives a preliminary warning of impact with the ground based upon the radar altimeter it gives the last minute, a last second advisory or command guidance telling the pilots to pull up, pull up. And the pilot flew, continued flying the instrument approach, continued his descend to the ground, even though the initial preliminary warning sounded and even though the final directive precautions sounded, they flew right through those. In aviation that’s one thing you just do not ignore –if the machine tells you, you should pull up because of terrain absolutely positively every time you pull up and you don’t ask questions. Robles: No matter what your other instruments are saying, no matter what anyone out is telling you pull up, right?? Moss: Exactly, if they are going off, then it means you did something wrong, either your reading instruments were incorrectly or you had the wrong altimeter setting set or something along that nature means that you are off. It means that you are unaware of your danger and they start telling you to start to pull up and think about that later. Robles: How much blame, do you think, can be placed on the ground controllers?? Moss: From what I’ve seen, the air traffic controllers really had no colossal part in this accident. The blame, in my opinion, lies almost exclusively in the cockpit in the airplane itself. The air traffic controllers, you have to understand, are kind of in a finny position, they control air traffic, they give instructions and guidance but they are not really the decision makers. They issue instructions, but the ultimate decision- maker is still the pilot in command of the airplane. Robles: There’s been talk from the Polish side that the airport in Smolensk, Smolensk Northern it is called in Russian, should have been just closed completely but under international law, since it was not a scheduled flight that would have been impossible. Can you share a little bit insight on that? It’s a presidential airliner, would it be possible in normal circumstances to deny that plane the right to land..
Moss: I’m not an expert on the international law as it applies to opening and closing airports in weather conditions, but here’s the case where each air field manager generally has the authority to close down an airport for weather, for other reasonable causes. But here’s the case we have a presidential airplane inbound. And the reasonable thing to do would be to leave the decision whether or not to land to the captain of the airplane. Robles: That was the President of AeroPacific Consulting in Torrance, California. That is aeropacific.net on the Net. Thank you very much..
Moss: You are welcome, John. John Robles: Mr. Cox, last time we spoke you had said that your experience with Russian investigators had been very good and that they were professional and regarded their reputations quite highly. Do you still stick to those words? John Cox: Absolutely. I believe that the Russian investigators are very high-quality investigators. I think that they will look into all aspects of the accident and work in cooperation with the Polish authorities to understand the ramifications. John Robles: In your opinion, is it common for a politician, even one as high up as a Prime Minister, to comment on an aircraft disaster report? John Cox: It is unusual to see a senior politician to take such a strong position on a technical document. And I am a little uncomfortable until we know all the details that are contained in this draft report. It is still in its formulative stage. It's been brought to the Polish authorities for input. So, I think it is a bit premature on the part of the Prime Minister. He may express displeasure, but I think it is part of the normal ICAO process. John Robles: The Interstate Aviation Committee (IAC) is responsible for civilian airspace and operations in the CIS. Do you have any experience working with them? John Cox: I have no personal experience with them, but I know they enjoy a good reputation as far as being a quality organization. John Robles: Anyway, Edmund Klich had said that there were 12 factors leading to the plane crash. What do you think those may have been? John Cox: It is most important to say that there are probably well more than twelve. In over 30 years of accident investigation I have never seen an aircraft accident be down to one or two causes. There are usually many causal factors and there are even more contributory factors. So, to fully understand what happened, you must look at contributory as well as the causal factors. I believe that it is highly likely that these 12 additional factors that were brought in; some maybe causal, some maybe contributory. In all my years of accident investigation have I ever seen it an accident be caused by just one or two things. John Robles: Some have made an issue whether the airport was military or civilian. 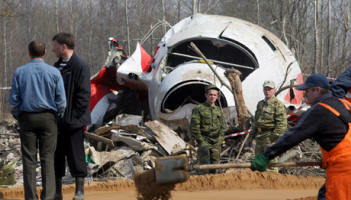 Apparently, as I understand it, under Polish law, or rules, if it was civilian the crew was 100 percent responsible. If it was military, then the military should have given them an order not to land. And there have been reports that they had over a dozen orders to pull up and they did not. Can you shed some light on that? Who is in charge, who is in control of the landing process? John Cox: In the end, the pilot flying the airplane has the final authority to land or not to land and that is true throughout civilian aviation. So, that final decision process rests with the captain. That being said, information from the ground can be very critical and we don’t know, to my knowledge, exactly what the crew saw or did not see. And that would play very heavily into the decision made by the flight crew. As far as military airport versus civilian, the rules may be different. I know that in some of the eastern European countries there can be a prohibition against lining up with a runway in, iclement or, bad weather, but this final decision still rests with the captain. John Robles: What would you say about reports that the president himself and the head of Polish military aviation were in the cockpit during the landing process? Can you comment on that at all? John Cox: I have heard reports that there were people in and out of the flight deck. On a VIP flight the flight deck door is permitted to be open in most operations. So, having them in and out of the flight deck during the course of the flight may be a very usual thing. As far as during the instrument approach itself, I don’t have information to say if there was pressure applied to the crew or not and who those people were. Normally, that close to landing, everyone is in their seats with their seatbelts fastened. It would be unusual to have a non-crewmember in the flight deck during that phase of flight. John Robles: Can I ask you a personal question as a pilot yourself? If you were in a similar situation, say, and you had the president of the United States standing behind you telling that you had to land the plane right now, and you knew that it was a very dangerous thing to do, what would you do in that situation? John Cox: I think it would solely depend on whether I could see or not, the safety of the airplane would supersede anyone’s comment to me, as to whether we had to land or not; that decision rests exclusively with the captain. John Robles: Mr. Klich said the head of the Polish military aviation had attempted to intimidate him into blaming Russia for the air disaster. Can you comment on that at all? John Robles: Is it possible, I mean, to fully blame the people on the ground for this? It sounds kind of odd to me. John Cox: It is never one thing. If there are issues with the ground they should be included in the report, if there's issues with the flight crew and if there's issues with the aircraft. All aspects should be evaluated and a good report will be inclusive of all the causal and contributory factors. John Robles: Here is some technical information I have, and this should be right up your alley. This is a quote from Vladimir Gerasimov, a Hero of Russia and a pilot: “The conventional rate of descent is 3.5 meters per second, and theirs was more than 9 meters. With such high vertical speed, I quote, the “descent” of the Tu-154 reaches 50 meters on the second round. In other words, after descending lower than 60 meters, the airplane fell into a trap, that's what they said.” Basically, once they had started descending, there was nothing else they could do. I mean they couldn’t pull up. John Cox: Jet aircraft are high-performance vehicles, and as such, they are capable of arresting descent very quickly. The Tu-154 is a well-known and well-tested airplane. Those were highly experienced pilots and if they did have an excessive rate of descent, which I have not seen proof of yet, then it would make it more difficult for them to arrest that rate of descent if they were close to the ground. That assumes that this excessive rate of descent actually existed. John Robles: Can you recover from a nine-meter rate of descent in the Tupolev Tu-154? John Robles: What would you say to all the people on the Internet and a lot of people in the press, who want to make a big conspiracy out of this and say that there were something planned behind it? John Cox: The are allegations that are made in virtually every aircraft accident I’ve ever been around, they are usually without foundation. My experience has been that if the agencies investigating the accident are cooperating and they are all directed to get the best and most complete answer possible, they will bring forward a full and complete report. And I believe that will happen in this case. John Robles: Is there anything you would like to add in conclusion? John Cox: I think the important thing to realize is that this is still not a finalized report. And so, before saying that conclusions can be drawn, I think we need to wait in fact, for that final report.There are still, obviously, discussions going on between the Russian investigators and the Polish investigators. I think once those discussions are concluded and the final report is released, then and only then can we see all the issues that contributed to this tragic accident. John Robles: Can you comment on the condition of the aircraft? John Cox: That airplane had received very high-quality maintenance. It was a presidential airplane and it was therefore kept to high standards. The Tu-154 is an older design, but that does not in any way imply that it is less safe. If properly maintained, aircraft of its age and older can certainly be flown safely for many-many years or decades. John Robles: Thank you so very much for speaking with me. John Robles: That was Captain John Cox, the chief executive officer of Safety Operating systems in Washington D.C. We were talking about the draft report on the investigation into President Lech Kaczynski’s airplane crash in April this year. Klich said the head of the Polish military aviation had attempted to intimidate him into blaming Russia for the air disaster. Can you comment on that at all?